12 Days of Deals–Day Eight! The details: Save 33% on these organza pouches! Sold by the dozen, these lovely pouches measure 2″ x 3″ and are ideal for packaging stocking stuffers, earrings, rings, and most smaller items. 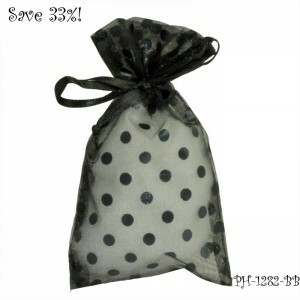 Made from black organza, these pouches have an added fun twist with black polka dots! 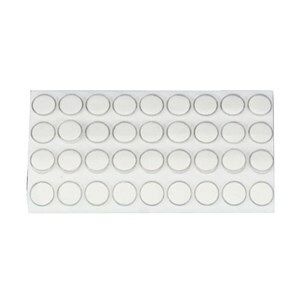 Pull shut with a black statin ribbon and you have an instant gift. Regularly $2.16/dozen. 12 Days of Deals–Day Six! 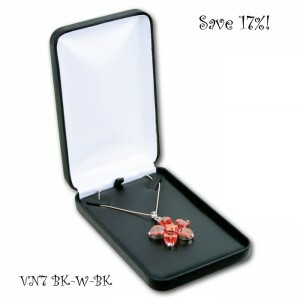 The details: Today’s elegant deal is our beautiful leatherette model necklace box (VN7-BK-W-BK). You’ll save 17% by purchasing this box now! Ideal for classic, elegant gift packaging, such as an extra-special necklace that is being given as a holiday present. Leatherette model is a luxurious material, and one of our finest boxes. Box measures 4 1/4 ” x 7″ x 1 5/8″ tall, and is black leatherette model, with a black insert and with white on the inside of the lid. Two-piece packer is included. Originally $4.23 per piece. Love this box and want to see more? 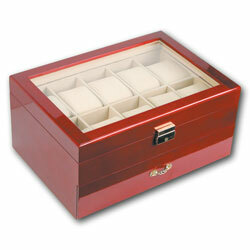 Browse our entire line of Leatherette Model Boxes. 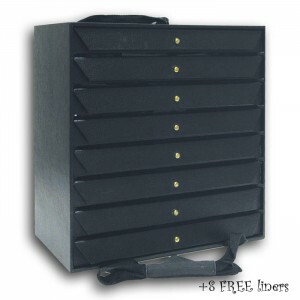 Day Five: Buy a Jewelry Storage Organizer and get 8 FREE liners! 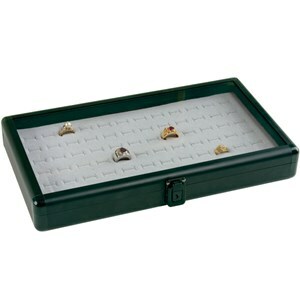 Details: The Jewelry Storage organizer has 8 trays with lids and measures 15 3/4″ x 9″ x 15 3/4″ tall. Usually, the liners are sold separately, but for today’s deal, if you buy an 883-2 at regular price, you’ll receive 8 tray liners for free! 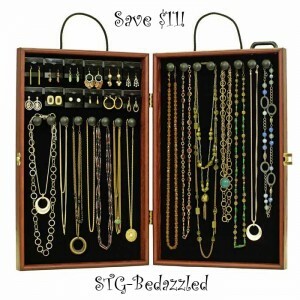 Shop the Jewelry Storage Organizer here! Day Three- Metal Earring Stand! The details: This elegant black metal earring stand holds up to 32 pairs of earrings, making it a versatile product that would be great n a jewelry display table, or for the earring lover in your life! Measures 10″ wide by 16″ tall. Shop this earring stand here. 12 Days of Deals Day Two! The details: this black poly hand display is regularly $7.40, and today you can have it for only $4.39! 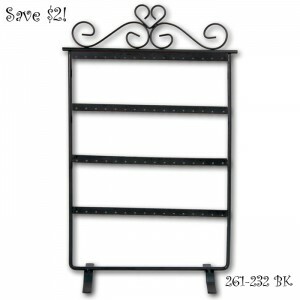 It measures 4″ wide and 8″ tall, making it an ideal choice for a bracelet or necklace display. Poly hands are a popular way to display jewelry in a unique and creative way. You’ll often see them as part of a window display, or as a fun focal point on a jewelry display table. Shop this poly hand display here. Introducing the 12 Days of Deals Before Christmas! For the next 12 days, we’ll have a new deal every day on an item you love (or that would make a great Christmas present!). To start things off on Day One, we’re giving you a savings of $9.55 on this beautiful Rosewood Watch Case. The details: Originally $59.40, today the case will be available for $49.85. This lovely case is perfect for the top of a dresser or on a vanity to keep a collection of watches in one, easily-accessible place. 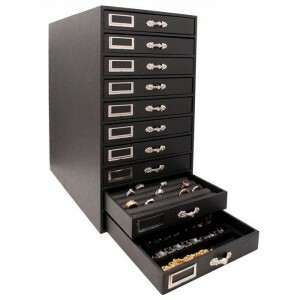 Holds up to 20 watches, ten on top and ten in slide out drawer at bottom of case. The glass top adds to the elegance of the case and easily allows you to see inside! Rosewood finish makes this watch case especially charming . Measures 11 5/8″ x 8″ x 5 1/2″ tall when closed. Have to have it (or know someone who would love this as a gift)? Shop here. 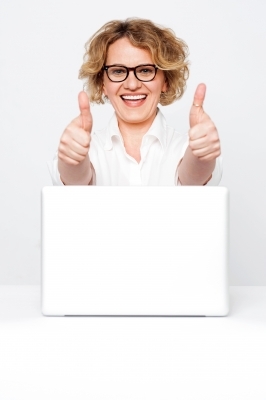 Don’t forget to check back for Day Two’s Deal tomorrow!